RoadRunnerGPS is a great app whether your an avid jogger, runner, or just walk your dog each day. It uses your BlackBerry's GPS to give you an in depth summary of your distance traveled, average speed, pace, calories burnt off, and the time it took you to do so. Its built in mapping shows a detailed description of where you are, where you have been, and how you got there. After each trek you can upload all this information to the online server for review. If you're a runner or walker, you know how invaluable it can be to see all your stats, and not having to buy a separate GPS device is a big bonus. 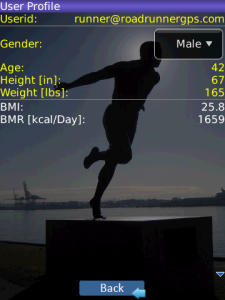 RoadRunnerGPS is available via BlackBerry Appworld for $4.99 with a 14 day free trial.